When Goldman Sachs purchased a c.1% stake in Facebook for $500m, the figure that hit the headlines was the $50bn valuation for the whole of Facebook that the sale implies. But is the company really worth that much? Is it really fair to extrapolate from the valuation of a small stake to the fair value of an entire company? Interestingly, the art world can shed some light on this. 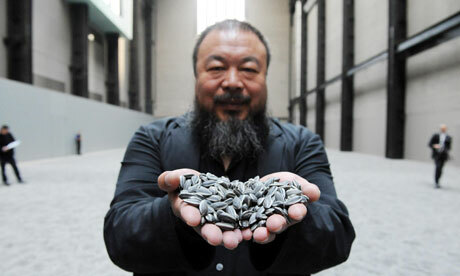 There is currently an installation in the Tate Modern by the Chinese artist Ai Weiwei made up of 100 million handmade pottery sunflower seeds. It is an imposing sight, with a mixture of possible symbolic meanings. It could be a commentary on China’s powers of mass production, or the scale of its population and relative insignificance of the individual. It might be a reflection on the power of nature or the beauty of simplicity. It’s probably about something else entirely. Luckily the symbolic meaning of the art is tangential to its relationship with Facebook. When it was first opened the installation could be walked on by the public. It was later closed off, ostensibly for safety reasons. But with tightened security, it meant it was no longer possible to walk off with a pocket full of pottery sunflower seeds. Given the high profile nature of the installation it was clear that the seeds would become collectors items – and unsurprisingly there have been several seeds changing hands on Ebay. It was reported in the press that a single sunflower seed had been sold at auction for £28. This is where the link to Facebook comes in: If we apply the same valuation calculation to Ai Weiwei’s artwork, the whole work would be worth £2.8 billion, making it the most valuable artwork ever created*. This valuation is clearly absurd! What it shows, though, is that the laws of supply and demand operate not just for commodities, but for fractional ownership stakes in a larger whole. Where demand to own a stake is high and the supply of stakes for sale is low, the price is naturally bid upwards. In my opinion it is this effect that lead to the high price for a small stake in Facebook. If the whole company were to be sold, for example in an IPO, I would expect a lower valuation than the $50bn+ reported in the press. But while its stock is privately held, the demand for it is so high that it will change hands for inflated prices. Fractional sales are a good way to create the illusion of a high valuation (see also Zynga, Twitter) - but as Ai Weiwei’s sunflower seeds demonstrate, this can’t be taken at ‘Face’ value. *In an auction at Sotheby’s on 15th February, a pile of 100,000 seeds was sold for £350k. Based on this unit value of £3.50 per seed, the whole work is worth £350 million, still a record breaking valuation.